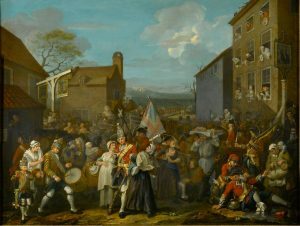 Hogarth’s March of the Guards to Finchley is a tremendous cacophony of a painting. There’s so much going on, you can almost hear the multitude of stories pouring from the canvas all at once in a confusion of voices. When Caro, the Foundling Museum’s infectiously enthusiastic director, stopped us in front of the painting, I remember looking on in awe. My eyes darted across it, taking in the action. I thought to myself ‘Good luck to whoever has to respond to that’. Not because it was uninspiring. Rather it was so rich with possibilities, that it would’ve been much easier to write 6,200 words, than a mere 62. It’s easy to see from even a quick glance that there are a trillion directions my little sestude could have taken. Would I explore the soldier in the foreground? Or maybe the women on either arm. The boxers in the back. The drummer on the left. The drunks on the right. The guards in the distance. The people hanging out of windows. So. Many. Possibilities. The museum label refers to the divide in Britain caused by the 1745 Jacobite Rebellion. A division reflected in the painting. This is a carefully composed work of art, after all. Everything is loaded. And an article I received from the museum, by Elizabeth Einberg, helped make that divide even clearer for me. Beyond that, there’s the story of the painting itself. Hogarth painted it as a gift for the King. But it was rejected immediately. So Hogarth put it up for a lottery, asking people pay to three shillings for a one in 2,000 chance of winning. When there were 167 tickets left, he gifted them to the Foundling Hospital. And the hospital won. To some this might seem like an obvious conclusion. But 167 out of 2,000 isn’t actually that many. It’s just over a one in 10 chance. Yet the hospital won. All this backstory brought up a bajillion ‘what ifs’ in my mind. About ownership and inheritance, good and bad, right and wrong, luck and chance. So, in writing my sestude, I had to go big. The twins in my piece do not actually feature in the painting. Their story represents its two halves. Of privilege and poverty. Birthright and lost inheritance. Rejection and salvation. Fairness and injustice. The blurred lines between virtue and sin. Just like the painting the twins are vulnerable to chance. To fate. Subjected to a social lottery with an outcome that is totally out of their hands. And just like the hundreds of foundlings who made it through the doors of the Foundling Hospital, destinies are changed forever. Some babies were lucky enough to make it. Some were not. Some mothers were able to come back and reclaim their babies. Some were not. In my mind, the gravity of all these ‘what ifs’, muffled the volume of the painting. It blurred everything and gave way to the humbling acceptance that sometimes you just have to leave things to chance. That bad must balance good. Tragedy balances comedy. And whether conscious or unconscious, the choice has to be made. E Einberg, ‘Milton, St John, and the importance of ‘Bottom’: Another look at Hogarth’s March of the Guards to Finchley’ in The British Art Journal, Vol V, No 3, pp 27-34.
the curse of having to choose. can carry but one babe. Who shall she keep; which is to go? Which is doomed; who is saved? In a split second, the decision is made. A dull punch through heavy-hearted silence.